The amounts between brackets are what I actually asked the butcher for, but I ended up using the indicated quantities. The beef and ostrich mince can be replaced with lean beef mince. This will make 2 huge patties or 3 big ones. Roast the pepper corns, coriander and dried chillies together in a dry pan until the coriander seeds turn brown. Put it all in a pestle and mortar and grind until fine. 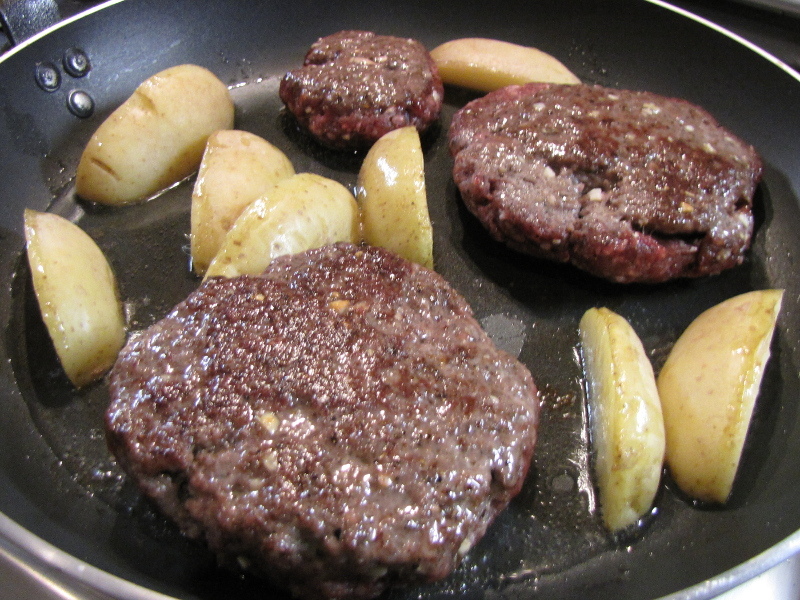 Make 2 or 3 patties and fry in a pan with oil until brown, but still pink in the middle. Remove the shells from the pistachios and fry them together with the jalapeños in a pan with a bit of oil until the nuts are golden brown. 2 potatoes cut into wedges (with skin on). These can be fried with the patties. 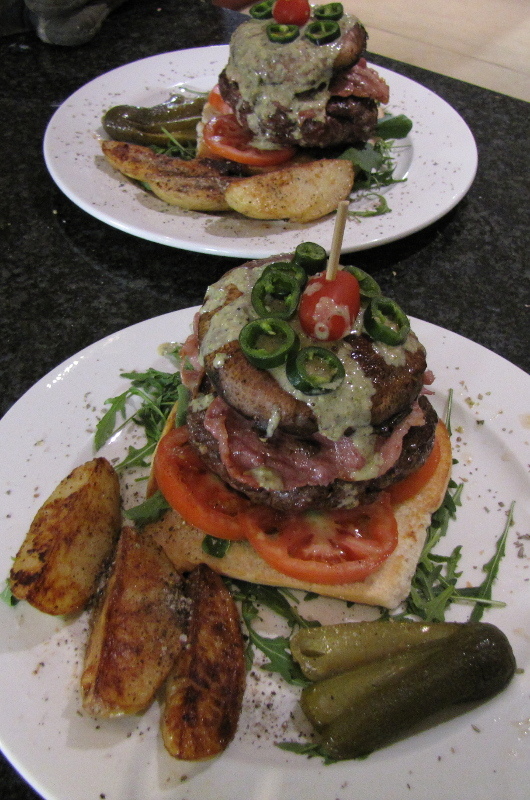 I served the burgers on top of a bed of rocket using a ciabatta which was briefly toasted, topped with fresh tomato slices, fried bacon, a whole fried brown mushroom, the sauce and fresh jalapeño rings on top with a cherry tomato. I pegged it all together with a wooden skewer. 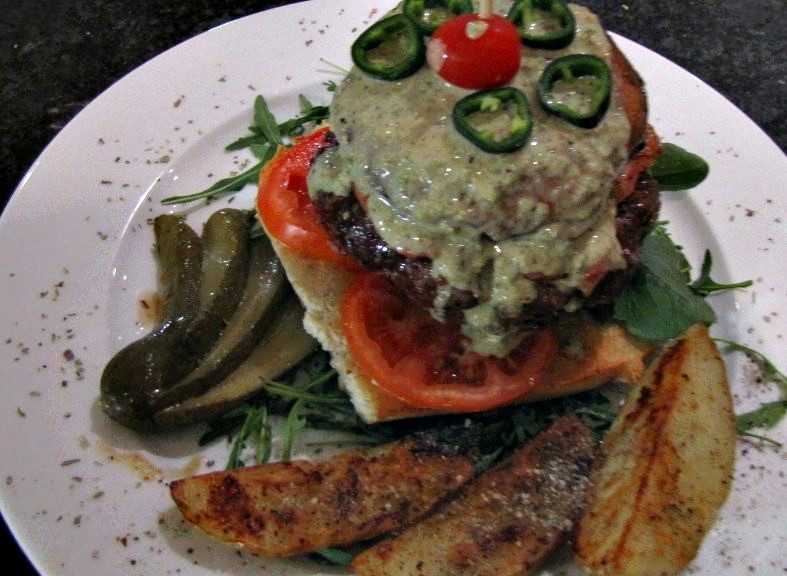 On the side there were potato wedges which were fried in a pan with the patties and covered with freshly ground black pepper, sea salt and paprika.